Hauskaa lauantaita, tervetuloa Allsorts haasteen pariin! Tällä viikolla kimaltaa ja kimmeltää. Syksyllä ostamani kettuleimasin sai nyt mustekasteen. Tracy Mouse's theme is "Bring On The Bling" ! The prize comes from Little Claire Stamps, welcome to join in. Edit !! !Thank you Ellie !!!! Everything here blends in so naturally with the paper, there are lots of details and yet the design doesn’t feel overloaded. I think it’s lovely. Love the little Foxy and so prettily embellished with the flowers and gems Mervi. The snow is back in the UK. Super sweet card Mervi, loving the design and the bling looks fantastic. 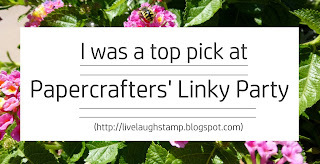 Congrats on being my top pick from last week's linky party! So well deserved!! Really gorgeous card, super image and love the design and the super flowers and papers. Cute! Thank you for joining the CRAFT challenge this week. Just adorable and thanks so much for sharing with Craft this week hope to see you back very soon. Aww What a cute card. Thanks for sharing with us at Through the Purple Haze. an adorable card and super cute image...luv the details and your coloring! I am so glad you played along with us at simon says stamp wednesday challenge! Thanks for joining us at CRAFT challenge this week. What a sweet card! Love the flower accents the most. Thanks for joining us this month for our challenge, hope to see more of your creative designs in upcoming challenges! 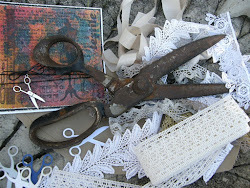 This is gorgeous Mervi, a fabulous make for my theme. 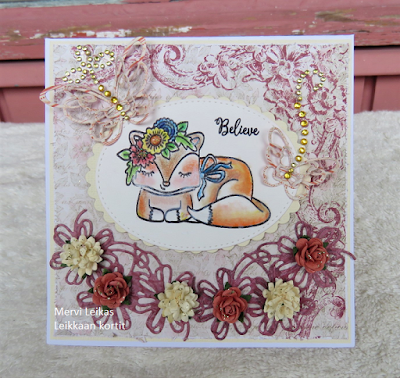 A totally "Foxy" card! Great job!